LinkedIn is only going to get bigger in 2019. Will you be utilizing it? With scandal and controversy rocking other major social networks, one network that hasn’t seen many issues is LinkedIn. With now over 500 million members and over 100,000 articles being produced per week to its blogging platform, this B2B social network shouldn’t be overlooked as we head into the New Year. Learn the differences in the LinkedIn Algorithm. While LinkedIn’s algorithm also priorities native content and engagements in the form of likes, comments and shares, personal stories seem to also do extremely well on its network. This is what they call the intersection between personal and professional content. In fact, LinkedIn actually has an internal team that looks at content that performs really well and opens it up to a much wider audience. That means it’s not just a scientific algorithm that chooses what people see, which is how all the other major social network algorithms operate. With LinkedIn, real humans are also involved and have a say. In addition, with the LinkedIn algorithm it is key not to just have your content seen by your first-degree connections. LinkedIn also takes into consideration people in your second and third degree network that view your content. You can achieve this by creating appealing content that your community engages with. Now that LinkedIn see that, it has a much higher opportunity to be seen by people outside your first-degree connection network. Utilize the new features LinkedIn now has available. You may or may not be aware but LinkedIn recently unveiled a slew of new features that every person and business should be utilizing. That includes its redesign of its Groups section, which involves a slew of new features in itself. One of those is group notifications which prompts members of groups to join discussions so they can easily stay-up-to-date with what going on in a particular group they are involved with. 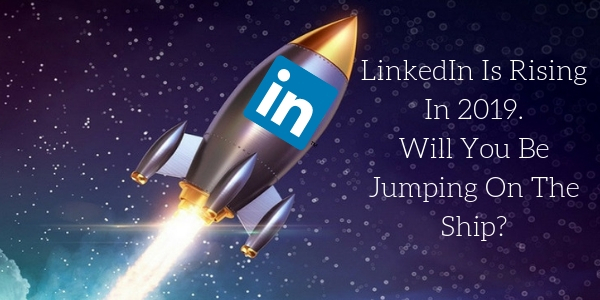 You can also compose posts now to your groups from LinkedIn’s main composer and content can be re-shared directly from the groups feed which gives the potential for the number of eyeballs seeing a piece of content to skyrocket. Hashtags and Trending topics are two other features that LinkedIn now embraces. With these features users can discover new content and join in on conversations that you didn’t have the ability to do in the past. Lastly, native video is now allowed on LinkedIn. That means you don’t have to embed a link from YouTube or other 3rd party source. By having this ability allows creators to gauge a videos performance in regard to not just views but other cool insights includes companies, job titles and locations of where your viewers came from. As you can see, LinkedIn is for sure up-ing its game. You just need to know how to best utilize it for your business and brand. For more information on how to make LinkedIn a valuable marketing tool for your business in 2019 contact The Interactive Imprint today at 954-254-1650 or visit TheInteractiveImprint.com.